Airbus last year delivered a record 635 aircraft and gained 1,036 new orders, expanding its backlog by 401 units. 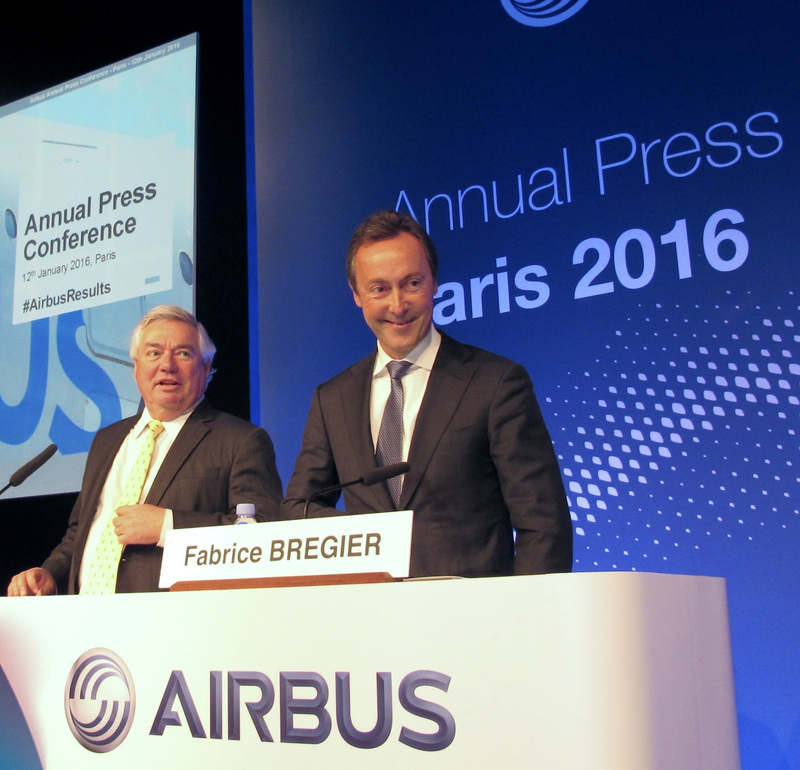 Announcing the 2015 results at a Paris press conference on January 12, Airbus CEO Fabrice Brégier indicated that 2016 will see a strong emphasis on strengthening the production process as the European airframer deals with heavy delivery commitments for several programs. The total backlog for Airbus now stands at 6,787 aircraft. For 2016, Brégier predicted more than 650 deliveries, including 50 A350 XWBs. Airbus expects its book-to-bill ratio to again exceed one. Lufthansa now expects to receive the first A320neo over the next couple of weeks, rather than late last year as last projected. Brégier confirmed that the slight delay in part involves the Pratt & Whitney PW1100G engines for the new narrowbody. I plans to deliver the first A320neo with CFM Leap engines next summer. Airbus expects start acclerating production of the A320neo in earnest in the second half of the year. In the first six months of 2016 Airbus wants to ensure production processes “stabilize” at its own factories and at those of its engine suppliers, COO Tom Williams told AIN. He expressed confidence that both Pratt & Whitney and CFM International [offering the Leap 1A engine] can increase their output as expected. Plans call for the A320neo to entirely replace the current version in production starting in mid-2019. Airbus missed last year’s delivery target of 15 A350 XWBs by one airplane. Brégier blamed seat and lavatory supplier Zodiac. He said he had exercised due patience and appeared irritated at the French firm's management team, who he said have been “in denial” about the problems. Airbus has de-selected Zodiac as an A330neo cabin supplier. However, it does not intend to switch to another equipment manufacturer for the A350, as Zodiac has now instituted a satisfactory "action plan," according to Brégier. Airbus's production rate plans call for a target output of 10 A350s per month by the end of 2018. It also hopes so-called digitalization will improve production across all Airbus plants and programs because, explained Brégier, it makes workers on the assembly line more connected with the company’s back offices. “We have to fix a lot of quality issues every year, and digitalization should help us anticipate and eradicate the problems,” he said. Airbus also worked on improving production rates for the A330 twinjet last year, he stressed. After collecting more orders for the existing model, the airframer now intends to build A330ceos at a rate of six per month until the A330neo enters full production. In Tianjin, China, where Airbus already operates an A320 final assembly line, plans call for the launch of the investment for an A330 cabin completion and delivery center next month with an undisclosed Chinese partner. Airbus expects the facility to be ready in 2017. Meanwhile, Airbus delivered 27 A380s last year, allowing it to break even on the program for 2015. Brégier attributed the accomplishment to cost cutting and indicated that he expects the company to manage break-even results even at annual delivery rates in the low 20s. Airbus confirmed that late last year it did receive an order for three A380s from an undisclosed customer. Although COO customers John Leahy would say only that the contract involves “a global leading airline,” he did little to dampen widely reported speculation that the customer is Japan’s All Nippon Airways. However, Airbus also reported that Russia’s Transaero has cancelled one of its A380 orders, bringing the net sales tally to just two of the widebodies in 2015.